Highlights : Visit Delhi and watch all its important historical places. Game Viewing at Corbett National Park. Meet with animlas like Tiger, Elephant, Cheetal, Deer, Sambhar, Barking Deer, Wild Dog, Sloth Bear, Wild Boar. Watch panoramic Himalayan and Ganga beauty. Attend evening prayer at Har-Ki-Pairi at Haridwar. 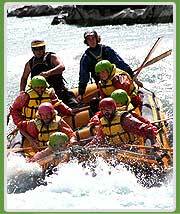 Activities : Game Viewing, River Rafting, Explore the panoramic beauty of Ganga and Himalaya. Possessing the rich natural heritage make India one of the most popular and sought after destination to enjoy the Nature Trip. 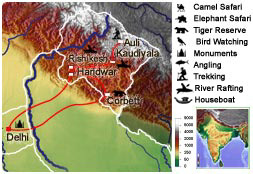 Whether it is northern or southern, every part of the country is flourished with several wildlife parks, hill stations, and rivers. The enriched natural landscape offers a nature tourist a tremendous range of nature spots to explore. Northern region of India, dwelled by panoramic Himalaya and several wildlife parks and many rivers, has some unmatched nature places to be explored. The 9 days family trip designed by us cover important nature destinations like Corbett, Rishikesh, Auli, Kaudiyala, and Haridwar. The tour, offering you a promising date with nature, is must to be explored by nature lovers. The Nature Trip beginning with the small visit of Delhi comes to its full wing when you visit Corbett. The place, housing one of the best Wildlife Park and Tiger Reserve, is a must visited place to enjoy your Nature Tour. Beyond the amazing Game Viewing at Corbett, there is other nature sports like River Rafting, which will be awaiting you to explore the nature's magical view. Our tour package will include the cost of your fooding, lodging, and travelling. Any cost other than these, you will have to bear the cost. We will be providing you the best possible free facility of tour guide. Any losses and harm of any of your luggage will not be our responsibility. Transportation while sightseeing will be managed by us. Timings and programs are subject to change. Your nature tour will take on with the small visit to Delhi on the 1st day. The places you will explore will include approximately all the importanat places like Qutab Minar, Humayun's Tomb, India Gate, Parliament and President House. By the evening, you will reach to Red Fort, Jama Masjid and Chandni Chowk which will be a great fun while exploring the old Delhi area. 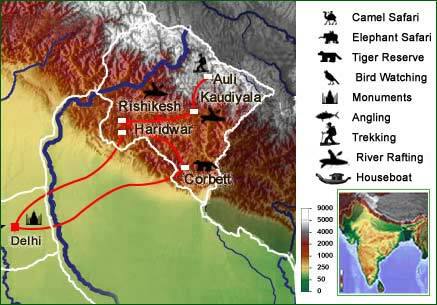 Your Jungle trail will begin next day (2nd day) when you reach Corbett after leaving Delhi in the morning. 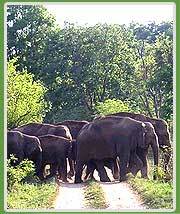 Visit to the Corbett National Park is a close interaction with the nature. Afternoon game viewing at this park will give you a best opportunity to explore the wildlife. Taking a Jeep Safari and roaming through the park will yield you a true and live portayal of Indian Wildlife. Spectacular view of animals like Tiger, Elephant, Leopard, Deer, Sambhar, Barking Deer, Wild Dog, Sloth Bear, Wild Boar, and Porcupine will make your nature tour amazing. The best moment of visiting this park welcome you next day (3rd day) early in the morning when you will take Jeep Safari and will explore the whole park again. The morning will give you better possiblities to enjoy Birding and listening to Tiger's growling. By the evening of 3rd day, you will be driving to Rishikesh. After overnight stay at resort, the next day (4th day), you will be visiting the holy town surrounded by Himalaya. Situated on the right bank of holy Ganga, this place will let you visit numerous famous Hindu temple, besides giving you a exquisite view of natural landscapes of Himalayan and Ganga beauty. Afternoon, you will be driving to Auli, one of the most popular Skiing and other winter sports spots in the country. En route, you will be visiting to Devprayag and Joshimath. After shoving off your tiredness in overnight stay at resort, next day (5th day), you will have full day to enjoy Skiing and watch splendid Himalayan Landscape. The whole place is full of nature places giving one hundreds of reasons to admire its natural beauty. Travelling to Himalayan and Ganga region, and missing to enjoy its River Rafting is nothing but a sullen way to spend your Eco Tour. To accelerate your nature tour to its perfection, you will next be moving to Kaudiyala, where you will be reaching in the evening on 6th day. Early in the next morning (7th day), your River Rafting expedition comes next to let you enjoy the nature adventurous thrill utmost. For several hours, you will be passing hrough the predominant rapids of Ganga, and finally getting it off with triumphant smile. The evening will present before you a grand religious ceremony as you will be witnessing the magnificent evening prayer at Har-Ki-Pairi at Haridwar. The nature tour will end with the visit to Haridwar which you will be leaving next morning (8th day), the second last day of your tour. After having morning full of leisure, you will be departing from Haridwar and will reach Delhi. The overnight stay at the hotel in Delhi will be last night of your tour. Next morning (9th day), after you have taken breakfast, you will be leaving for airport to catch your flight for your onward destination. Copyright 2008 © Eco India. All rights reserved.